Ben & Jerry’s is known for its inventive and delectable flavors, and now it’s added another to its roster. 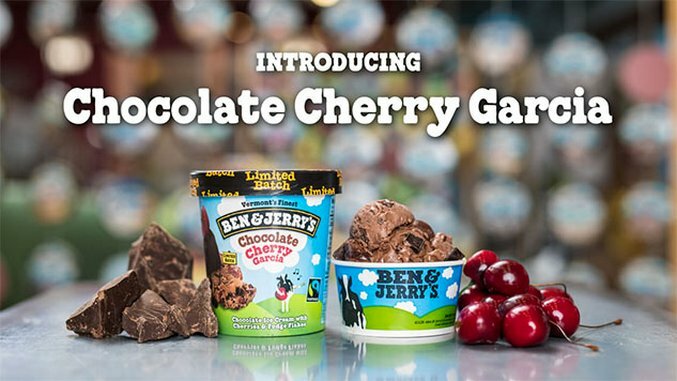 Chocolate Cherry Garcia, a twist on one of the brand’s flagship flavors, will hit stores in pint form in the near future, and is already available in scoop shops. According to the flavor’s description, this new ice cream is exactly like Cherry Garcia—cherry ice cream with chunks of chocolate and thick blocks of frozen cherry—except in this new flavor, the cherry ice cream has been switched out for classic chocolate. Chocolate Cherry Garcia is the brand’s latest limited-batch flavor, and it sounds like a much more chocolate-focused version of the classic cherry flavor. While Cherry Garcia may be a formula that doesn’t need meddling with, adding more chocolate to things is rarely a bad move. For all their rule-breaking, even Ben & Jerry’s understands that. Find the pint of Chocolate Cherry Garcia nearest you using Ben & Jerry’s limited-batch locator.